Mature dating is the fastest growing pool in terms of online dating nowadays, and it’s easy to see why. Whether you are looking for a casual encounter, a more serious relationship, or just a great way to build confidence and see who is out there, Singles Fifty can help you meet likeminded singles in the UK. With excellent functionality and competitive pricing, make a free account today and browse with no obligation whatsoever. Senior dating can be complicated enough, without a lengthy sign up process to contend with. Enter a few simple details such as your age and gender, and make sure you have an email address you can easily access, and you are ready to go. You will be prompted to answer a few profile related questions, both open ended and specific to get started on the website, but you can always skip these for later. Upload a photo as soon as possible for your best chance of gaining interest from other users, and try to be specific and honest when you answer the questions in the profile section. Much of Singles Fifty matchmaking is based on algorithms which use your profile information to suggest likeminded singles. The more you tell the world about your likes and interests, the better a chance of a great match! Once you have verified your email address, you will be taken straight to the home page of the website, where you can easily add to or edit your profile with the steps you have missed. Singles Fifty even tells you in percentage terms how much more you have to complete to make the most of your website. Senior daters will find the website easy to navigate due to everything being easily accessible from the home page. Browsing and searching singles profiles is also intuitive and fun, with no technical knowledge required. Searching through thousands of singles profiles can be no easy feat, but Singles Fifty is all about keeping things simple. Use the search functionality to have matches suggested to you, or to search with a number of filters, including physical appearance, education, religion and interests. If you want to use more of the website than simply search, there are a number of interesting extras available to you. Send winks and online gifts to express interest, or use the intuitive ‘Encounters’ feature to quickly browse through singles with an easy yes or no. Once you have found someone who catches your eye, you can send an inbox message, or even launch straight into live chat if they are currently online. 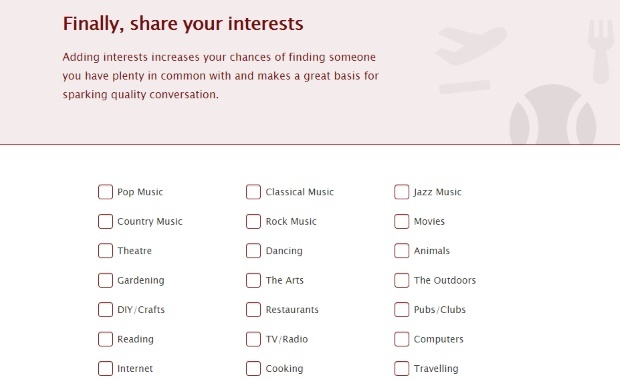 One unique feature, which may appeal to senior daters, is the ability to expand on your profile into a dating diary. This online blogging tool allows you to tell other members more about yourself and your dating history, and gives you the chance to read more about other members before you make a connection. Bolt-on extras are available at an extra cost, but are full of fun functionality such as read receipts for your inbox messages, or the ability to unlock your own inbox so that everyone can contact you - regardless of their subscription level. Fifties Single takes no risks with your online safety and understands that mature dating can come with apprehensions. That is why they use a third party solution Online Dating Protector and employ a team of highly trained moderators on the website 24 hours a day. This team is highly adept at spotting any kind of malicious behaviour or suspicious activity, leaving you at ease to find your ideal match. 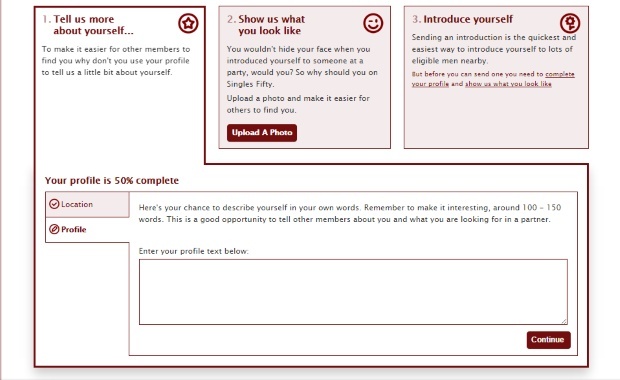 Once you have found someone, be sure to utilise the extensive safety tips which give excellent and well-structured advice on everything from spotting fraudulent behaviour which may risk your identity, to how to report someone for abusive language or intent, as well as the best ways to keep yourself safe when moving from online chat to a real life meet. This safety tips section, accessible from the bottom of every page of the website, is an excellent resource whether you are first time online looking for love or well used to the world of internet dating. As we have mentioned, signing up and browsing singles is free, as well as creating your profile and sending out an introductory message. Once you are ready to move past that functionality, the price of subscription will differ depending on how long you want to commit to. Obviously, the longer you sign up for, the more competitive the monthly cost will be. One month of full access (minus the bolt-on extras) is the most expensive, £29.95, with 3 months commitment already reducing the cost to £19.99. 6 months is £15 per month, while the cheapest option is a year’s subscription for a minimal £12.50 per month, only 42p per day. With extensive safety guidelines for all levels of experience with online dating, along with 24 hour moderation, seniors can feel comfortable testing the waters or jumping in headfirst with Fifties Single. Easy to navigate, with step by step instructions for signing up and building a profile, plus loads of additional features to customise your dating experience at your own comfort level.